Global Communication Maturity | Language Solutions, Inc. 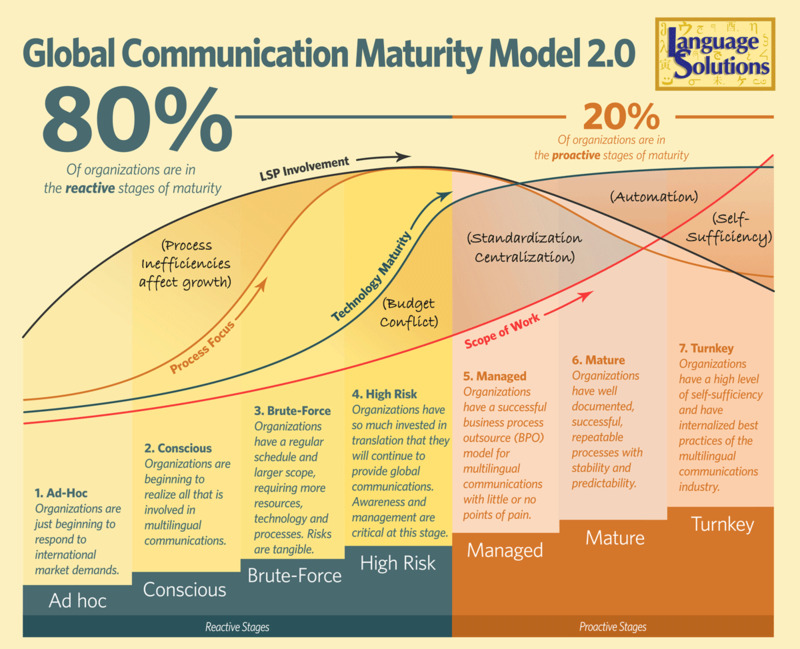 The LSI Global Communication Maturity Model™ 2.0 shows a view of the stages through which organizations will progress when implementing a global communications strategy. This strategy involves translation and localization of their content in other languages and the progression through each stage is influenced by the amount of content that an organization is translating. Each stage also represents a point in time when an organization faces unique challenges that must be met and built upon in order to move forward on this journey. Various groups in your organization may have different goals but alignment of those goals is on the maturation model. All groups are working toward moving the organization further on the model – toward efficiency, cost savings, quality in communications, less risk exposure……getting a better handle on International. Click on the image of our model below to print and ask your group where they feel your organization is RIGHT NOW in their current stage. Bring in the model to start the discussion, to find a strategy, to move forward, to make decisions.